We carry about a dozen different wines from Switzerland, a wonderful country with an economy which is amazing. We used to go cross-country skiing in the Engadiner Valley and I can say that the price of everything is high. A few years ago a dozen eggs cost something like $9.00 !!! Swiss wines are equally pricey. I recently tasted a flight of extraordinarily expensive Merlots from Ticino. I know the cost of the wine is inflated with the importer and distributor mark-up, as well as that of the shop, but it's safe to say Swiss wines are not for the economy-minded wine consumer. I was amused (some years ago) when the Wine Spectator did a cover story on Swiss wines, since these are not much in demand in the U.S. marketplace. While publisher Marvin Shanken has succeeded brilliantly with bringing cigars back into style for a brief period, I'm afraid he didn't have the same effect on the sales of Swiss wines. Most people are simply preparing a Raclette or Swiss Fondue and are looking for something in keeping with the theme of the evening. These wines attract the kind of consumer who loves to explore the next frontier before others know there is one. The center of this region is the town of Sion, which is a name you might encounter on a wine label. The primary white grape is called "Fendant" (known as Chasselas in other parts of the world) and its wine is dry, a bit low in acidity and it's a bit subtle in terms of its character. Sylvaner is also grown in this region, but it's known as "Johannisberger," despite the presence (in tiny quantities) of Riesling. Marsanne is cultivated here and is called "Ermitage," while Pinot Gris is disguised as "Malvoisie." Other grape varieties to be found include Amigne, Arvine, Humagne and Pa�en (known as Heida in the Haut-Valais). The Pa�en (Heida) is said to be the Savagnin of France's Jura region and this is somehow related to Traminer. 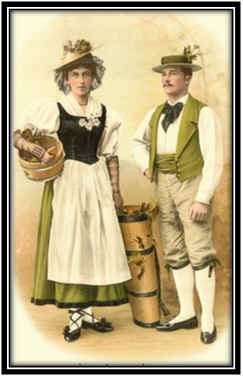 Humagne is thought to be the most "typical" ambassador of the Valais. It's described as having aromas reminiscent of lime blossoms and experts will tell you it ages magnificently. Arvine is a well-regarded variety and that variety has been planted in northwest Italy where it makes some marvelous dry whites in the Val d'Aosta. The Amigne grape was sparsely planted some years ago, but vintners seem to be increasingly enamored with this variety. There's a tangerine/orange fruit sort of character, typically and there are both dry and sweet versions. The Sauvignon Blanc grape finds a place in the Valais and you'll find the Rhone's Viognier here and there, but mostly in the town of Fully. Chardonnay is planted hither and yon, but it's scattered and accounts for a tiny percentage of the region's grape vines. The upper Valais has a few curiosities, too...Lafnetscha, Himbertscha and Gw�ss can be found if you look diligently. In red wines, Pinot Noir is the predominant variety, with Gamay also being cultivated here. Typically wines labeled Dole are 2/3s Pinot Noir and 1/3 Gamay. As these tend to be chaptalized (sugar added to the unfermented juice to make up for the natural lack thereof), the wines are usually a bit on the light side. Syrah now is making inroads in the region. In fact, Syrah seems to be an ideal variety for this region and top growers are making some stellar wines. Production, though, is limited and they seem to have difficulty supplying their home market, so these are not easily found outside of the country. Cornalin is another interesting red variety. It also goes by the name Humagne Rouge, but it is not related, apparently, to the white version of Humagne. Cornalin is found, as well, in the Val d'Aosta. It typically offers a cherry-like fruit quality. Diolinoir is an oddball...it's a cross of Pinot Noir and Rouge de Diolly (or Robin Noir, if you prefer). Gamaret, anyone? This is a hybrid of Gamay and Rechsteiner (a white grape) and it now covers close to 1000 acres of vineyard land. There's even another variety of the same parentage called Garanoir, though it's less widely-cultivated. Carminoir is a crossing of Cabernet and Pinot Noir...it's a relatively new variety, so the jury is out on this one. Eyholzer Roter is mighty obscure and it's found in the Upper Valais. There are about 22,000 grape growers in this region, tending but 5,200 hectares of vines. Only 700 produce and bottle any wine commercially, so the bulk of the production is handled by cooperatives or negociants. 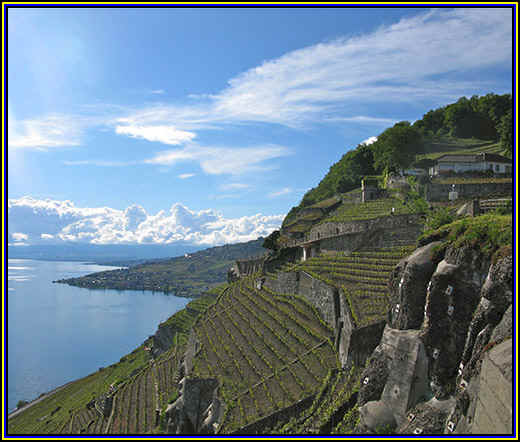 This region includes the vines on the north shores of Lake Geneva and the Rh�ne Valley. Chasselas is grown here (of course). It is in the Vaud where you'll find the prestigious white wine called Dezaley where Chasselas is said to be at its best. The vineyards in the C�tes de l'Orbe, Bonvillars, on the shores of Lake Neuch�tel and in Vully comprise about 10% of the Vaud. 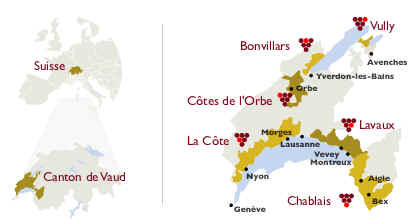 La Cote covers a bit more than half of the Vaud, including the Morges region (Chasselas in white and Gamay in red are the major varieties there). 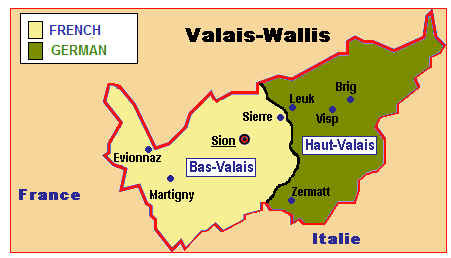 Lavaux covers around 21% of the Vaud and some very important appellations, including Dezaley and St. Saphorin. The Chablais region tallies to 15% of the region's grapevines and here you'll find the well-regarded Aigle area...the white wines are said to have a flinty character. This is Switzerland's third largest viticultural region and there are close to 100 wineries within the area. Conventional wisdom says Chasselas is cultivated here, but goes under the name "Perlan." This is simply to confuse outsiders. Other white grapes cultivate in the area include Chardonnay, Pinot Gris, Pinot Blanc, M�ller Thurgau, Sauvignon blanc, Gew�rztraminer, Scheurebe and Aligot�. Gamay is the red wine leader in the area, though there's Pinot Noir, a tiny bit of Merlot and some lovely, world-class Syrah. 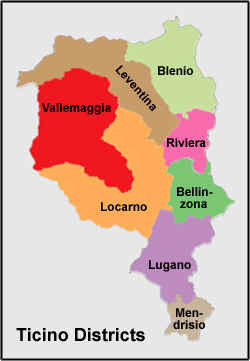 This appellation comprises three sub-regions and you may hear people refer to this as the Three Lakes region. 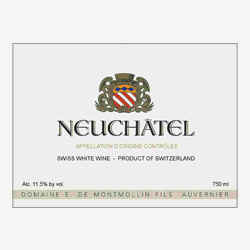 In terms of grape varieties, Chasselas is king and the white wine bearing the Neuch�tel name is quite famous. Pinot Noir, Pinot Gris and Pinot Blanc also find a home in Neuch�tel, along with Sauvignon Blanc, Gewurztraminer, Chardonnay, M�ller-Thurgau and Viognier. Charmont and Doral are grown there, both being a cross of Chardonnay and Chasselas. The "new" red varieties of Gamaret and Garanoir are cultivated, as well. You'll find some pale "blanc de noir" wine which is typically called "Oeil de Perdrix" (eye of the partridge). This term may have originated in Switzerland, it's said, but it was not trademarked and so the term is found on bottles of French Champagnes and other pink wines. 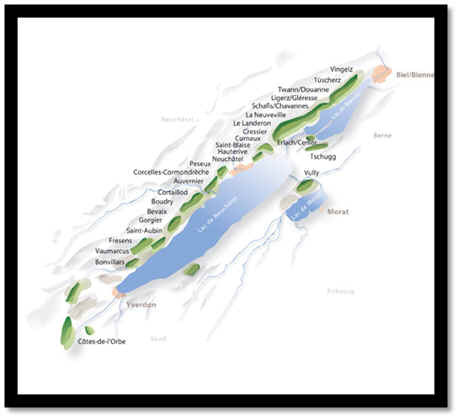 This is a wine area around Lake Biel, with sub-regions including La Neuveville, Ligerz, Schafis, Schernelz and Twann. About half of the wine in Bern is made from the Chasselas grape, with about one-third being Pinot noir, M�ller-Thurgau, Pinot Gris, Chardonnay and Gew�rztraminer account for most of the rest of the production. Here's an Italian-speaking part of Switzerland, just north of Italy and Merlot is the primary wine. As noted above, these can be rather expensive and they find a receptive audience on their home turf. The grape seems to have arrived from Bordeaux back in the early 1900s. It proved well-suited way back when and today something close to 80% of Ticino's vineyards are planted with Merlot. However, there are a few vines of Pinot Noir, Cabernet Franc, Cabernet Sauvignon, Syrah, Gamaret, Chardonnay, Pinot Blanc, Sauvignon, Semillon and Pinot Gris. Not to mention "nostrani Americani" (even the curiously foxy grape called "Clinton" is cultivated here!). There is a current fashion of vinifying the red Merlot grape as a white wine, too. The use of small, French oak barrels is fashionable, too. Some producers are making blended, barrel-aged whites, as well. The Gilliard family has more than a century of experience in growing vines and making wine...theirs are our most popular Swiss selections as the firm's products are routinely of good quality. The firm began in 1885 and the family running it today is named Haller, though related to Gilliard by marriage. Gilliard makes a wine called "Les Murettes" which is a "Fendant P�tillant" and bottled from the lees (spent yeast), somewhat like a Muscadet from France's Loire Valley. The vines are grown in slate and granite and you'll find a minerality in the wine as a result. 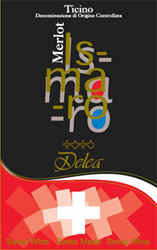 A good red wine called "D�le des Monts" is available. It's a blend of about 80% Pinot Noir and 20% Gamay. The Pinot component dominates and this shows a nice cherry-like character. It's a smooth, medium-light bodied red. Pierre-Luc Leyvraz runs a small domaine in the Lavaux region of Swiss wine country. This is in the canton of Vaud, situated on the north shore of Lake Geneva. If you're a hiker, there's a trail called "Les Terrasses de Lavaux." Leyvraz makes a wonderful dry white of the St. Saphorin appellation. This is made of the Chasselas grape coming from several parcels owned by Leyvraz. It's vinified in stainless steel and undergoes a secondary, malolactic fermentation. He matures it on the spent yeast sediment for some months before bottling. It's fresh, dry, crisp and mildly minerally with a faint appley quality. Very fine and well-priced. The brand "Bon Pere" is rather well thought of in Switzerland, the Germanier family having been winemakers for more than a century. The firm is located in the town of V�troz in the heart of the Valais region. The firm is a proponent of organic farming practices, according to what I've read. Vines average about 35 years of age and yields are kept to "sensible" levels. A very fine Syrah (best Swiss red I've tasted, I think) is cropped about 35 hectoliters per hectare. On the other hand, Chasselas yields are more than double...no wonder its wine is less intense. CAYAS Syrah du Valais is from the 2004 vintage. The wine is matured in French oak, half of which is new. I find the wine to be more elegant than many Rh�ne Syrahs, but still with nice spice, red fruit aromas and flavors and a finish that lingers nicely. It is not cheap, but if you've seen the price of Swiss chocolate or time-pieces, it's actually reasonable. Fly SwissAir's business class and you'll likely be offered a glass of the Fendant "V�troz Les Terrasses." The wine is made entirely of Chasselas and shows lovely fruit...reminiscent of white flowers and a hint of a minerally note. Dry and light. D�le "Balavaud" is a typical blend of Pinot Noir and Gamay. It shows aromas of both...some cherry notes, along with strawberries. Dry, I don't find much wood here. Smooth, it's best served at cool cellar temp. Medium bodied, fairly delicate little dry white wine. The wine comes from a vineyard site overlooking the Lake of Neuch�tel. The soils are of limestone and the wine is slightly reminiscent of a delicate white from Burgundy. Best with delicate, simple seafood or mildly-smoked fish. It's entirely Chasselas, of course. It is one of our more popular offerings. Many people seem to enjoy this with Raclette...though it's fine with light seafood dishes, too. The d'Auvernier Pinot Noir is a light red wine...a far cry from the wines of Monterey's Santa Lucia Highlands, Santa Barbara or the Russian River Valley. It's even a shade lighter than most Anderson Valley or Willamette Valley Pinots. Fans of local Pinots may not appreciate a wine of such delicacy, especially since it doesn't have a percentage of Syrah to add color and body. One of the most famous wines in Switzerland, this is the one depicting a small lizard (I don't think that's a food pairing suggestion, though let me know if you do try this combination of vittles and vino). 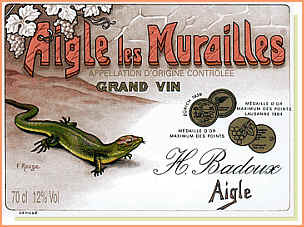 Aigle comes from the Chablais area of the Vaud and is made entirely of Chasselas. Their D�zaley wine is considered a "grand cru" (L'Arbal�te being the particular designation of this). It's made entirely of Chasselas grown on a steep vineyard site that has rather slatey sub-soils. The wine is dry, mildly minerally with a hint of a honeyed note with a faintly floral tone. Sadly it's costly, but we still have customers who buy a bottle or two of this for their Swiss dining (and wining) pleasure. The Dubois brothers are the fourth generation to cultivate vines on slopes overlooking Lake Geneva in the D�zaley area. The name of this interesting dry white wine, made of Chasselas (like Fendant, for example) stems from the vines being on steep slopes. If there was some erosion and the vines slipped down the hill, this diabolical catastrophe was attributed to the devil. The cellars of this vintner are said to be reminiscent of the architecture one finds in France, especially Paris. It's known as the "Petit Versailles." We keep a few bottles of this famous little white wine. 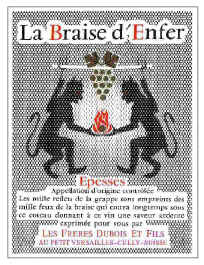 so if you're searching for a wine with the Epesses appellation, this is it! Angelo Barrea's winery is in the Italian part of Switzerland and it's a fairly new enterprise. The company was founded in the 1980s and the current winery was constructed in 1993. It features modern, stainless steel fermentation tanks and an old-styled, vaulted ceiling cellar. The vineyards comprise about 20 hectares and Delea turns out a range of wines and some grappa. We currently have a nice little Merlot...not a gussied up, oaky red wine, but a fairly typical example of Ticino red wine. It's a medium-bodied wine offering some red fruit tones and a faintly herbal note. It's smooth enough to drink immediately. The Montmollin brothers run this old domain in the Neuch�tel region of Switzerland. Pierre and Jean-Michel de Montmollin are fans of old vines and modern technology. They're also interested in environmentally-friendly vineyard practices. They duo owns four different domaines, each on the north shore of Lake Neuch�tel. There's quite a range of wines being produced as well as some eaux-de-vie. We have a rather nice example of Neuch�tel from these fellows...a 2009 vintage made of Chasselas. Dry and light, it pairs well with mild seafood dishes best, but someone recently told us they enjoyed it at a fondue party. The Rouvinez family owns numerous vineyard sites in the Valais region. They own well more than 40 hectares of vineyards in eleven different sites and they're producing an impressive range of wines. We have a nice, medium-light bodied Dole, a blend of Gamay and Pinot Noir. The Gamay brings a strawberry and fruity aspect to the wine, while the Pinot Noir brings some nice character of cherries. It's not a "big" wine, nor is it styled along the lines of New World reds, so you won't find oak here, nor much tannin. It's dry and not terribly tannic, so we like it served at cool cellar temp. 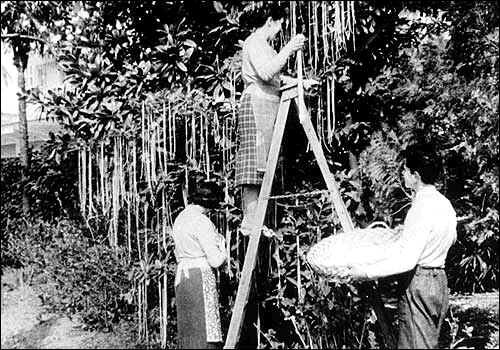 cultivation of Spaghetti, do treat yourself to this educational presentation. IF YOU'D LIKE TO DISCOVER A WHITE WINE FROM THE FRENCH SIDE OF LAKE GENEVA, CLICK HERE.